Duke Nukem Forever, the game which was promised as way back as 1997, has finally been given a new release date which will see the title coming out in 2011. The history of Duke Nukem Forever is a long and rather convoluted one which culminated in 3D Realms the maker of the game settling out of court with publishing house Take-Two and eventually collapsing as a company is 2009. Now Gearbox Software has taken the mantle and Duke Nukem Forever will come out in 2011, according to 2K on its Twitter page. The game was also shown off at games conference PAX 2010 where, according to 2K, the queue to see a demo of the game was 2.5 hours long and the footage shown was "seamless". The boss of Gearbox Randy Pitchford told crowds at PAX that the development of the game was actually complete, explaining: "When Duke ran into trouble, we were glad to [help him out of] a spot. You can't let the Duke die, right? "We wanted to deliver the game this is supposed to be." Considering the last Duke Nukem (Duke Nukem 3D) came out when the likes of Quake was vying for gamers' attention, it will be interesting to see how the franchise will fare in the world of Uncharted and the like. 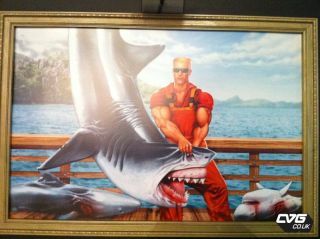 Considering one of the screenshots of the game is of Duke wrestling a shark, we have a feeling he will do just fine. If we all cross our fingers together, then Duke Nukem Forever will have a UK release date of some time of 2011 and will be released on PS3, Xbox 360 and PC. Or if ShopTo.net has it right, we could even see the game come out in the UK 19 November 2010. But that does sound too good to be true.